Kerri Bradford Studio. After running them through my printer, I used my Silhouette to cut them out. 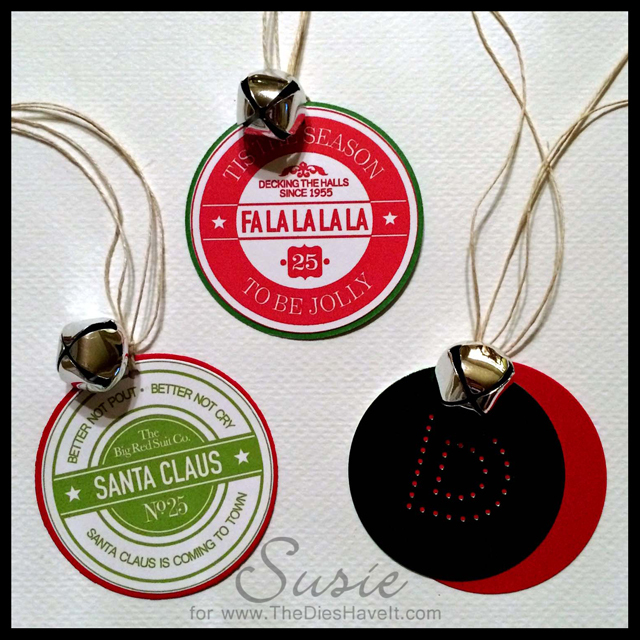 I backed each with colored card stock and then added twine and a jingle bell. I made six of these in various colors. The black and red tag is a die cut metallic circle with an initial die cut into the center. The peekaboo alphabet is from MFT Stamps. I added a red circle to the background, a jingle bell and some twine for tying. I made five of these for gift bags. I am all ready for Christmas and hopefully you are too. Have a wonderful holiday!